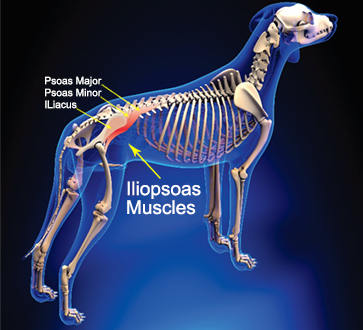 Iliopsoas Injury of the muscles occurs in dogs after a fall, slip or overstretching. The iliopsoas muscles are the main muscles that flex and externally rotate the hip. Think of the dog that is urinating; these muscles are essential for this function. In fact, pets that have injured these muscles may stop hiking their leg when they urinate. There are three muscles that act together to support the hip in this motion: the iliacus muscle, the psoas major and the psoas minor. They originate from the vertebral process of the lumbar vertebrae and the inside of the wing of the ilium and they insert on the lesser trochanter of the femur. These muscles are also responsible for the “spring-loaded” arch of the back that a dog uses while running. Symptoms include difficulty rising, a reluctance to climb stairs or jump, difficulty defecating, difficulty (or a complete inability to) bearing weight, hind limb lameness (exacerbated by activity) and a decreased performance in competition dogs. Signs to be aware of are a strange gait, such as outward rotation of the leg when walking, or tucked up, or an arched back when walking. Additionally, deep palpation of the area is painful. Not specific to any one breed, but more susceptible are the athletic, agility training and sporting dog. Diagnostics can include Arthroscopy, MRI, Radiographs or an Ultrasound of the muscles. Anti-inflammatories and pain medications are normally prescribed when symptoms are mild to moderate. Cold laser and acupuncture treatments also help reduce the dog’s pain, but none of these methods repair the muscle. The underlying problem must be treated if the pet has one. Chronic inflammation of the iliopsoas muscles or tendons may be injected with Platelet Rich Plasma (PRP), with or without stem cells, to reduce the inflammation and restart healing. Stem cell can be injected into the muscles of the hip (groin muscles), thereby, reducing pain and restoring movement in your dog. Rehabilitation and conditioning are the keys to treating and preventing iliopsoas muscle injury. Therapy includes a combination of therapeutic exercises and cold laser treatments. Treating the inflammation with cold laser therapy, stretching, massage and trigger point release are all modalities used, depending on the case. Physical therapy includes core strengthening (using therapy balls), teaching doggy planks and sit ups. Obstacle courses that include crawling under chairs and through tunnels is an excellent core exercise as well. Walking backwards and zig zag hill walking helps with the hip flexors.